Everyone wants to know the truth about their favorite celebrities’ heart’s desire. Within the masculine culture of Hip Hop and Hollywood, there is a well-known gay subculture that industry insiders are keenly aware of but choose to hide. Terrance Dean worked his way up for more than ten years in the entertainment industry from intern to executive, and has lived the life of glitz and bling along with Hollywood and Hip Hop’s most glamorous. With a family full of secrets and working in an industry founded on maleness — where one’s job, friendships, and reputation all depend on remaining on the down low and in hiding — Dean writes a revealing account of the journey of coming out from hiding. 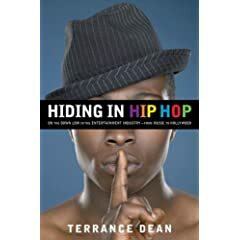 Full of startling anecdotes and incredible true stories, Hiding in Hip Hop is not a traditional tell-all. A personal and poignant memoir, it is also one of the most provocative and honest looks at stardom and sexuality.